MoreVision has a particular expertise in the structural design of construction equipment. 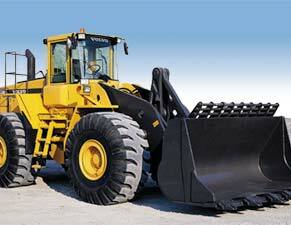 We provide the "Design of Construction Equipment" course to leaders in the industry. We have devised new methods of assessment for our clients and invested in software to speed up the assessment procedure. This software is available for use and/or modification as required by new contracts. MoreVision built a mathematical model of complete vehicles (see our excavator arm example ). The model could calculate any geometrical configuration of the excavator arm. Digging and dipping forces would be calculated for each geometric configuration. The model calculated geometry envelopes, digging force envelopes and lifting force envelopes. The performance of competitor machines could easily be assessed and compared on a like for like basis because the model was fully parametric. 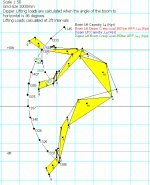 MoreVision developed an ANSYS script to generate a simple beam model of a loader and chassis which could be positioned in any geometric configuration (loading position, raised position etc.). The model was used to determine free body forces acting on each component in the machine (Chassis, arm, links, rods and buckets). The free body forces could be extracted from the beam model and applied to a detailed solid finite element model of each component (the picture opposite shows the arm component). The solid models were used to perform a detailed static strength and fatigue strength checks. A non-linear plastic analysis of this arm was also performed for an overload case to determine the permanent and magnitude of residual stresses. Claas had acquired a business which manufactured telehandling vehicles. Traditionally telehandling vehicles have been designed without any particular structural design methodology. MoreVision were commissioned to develop a structural design performance specification for the vehicle, this included the telescopic arm and the vehicle chassis. Subsequently a full static and fatigue assessment against the specification was undertaken and a summary of design change recommendations were delivered to the client.